1. Cook the rice in a large pan of boiling water according to the pack instructions. Cool under cold running water and drain well. 2. Place the rice in a large bowl and add the lamb, chutney, cumin and mint. Divide the mixture into 8 and firmly mould each into a flattish sausage shape around 15cm long. Grill for 15–20 minutes, turning occasionally until well browned and completely cooked through. 3. Meanwhile, stir together the cucumber, tomatoes, red onion, green chilli and lime juice to form the kachumber salad. 4. Warm the naan bread under the grill and cut each into 4 quarters. 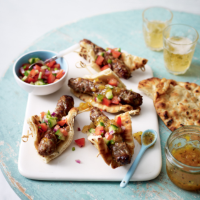 Wrap a keema kebab in each quarter of the naan, securing in place with a bamboo skewer. Serve with the kachumber, a spoonful of chutney and a scattering of mint. a large handful of fresh breadcrumbs.